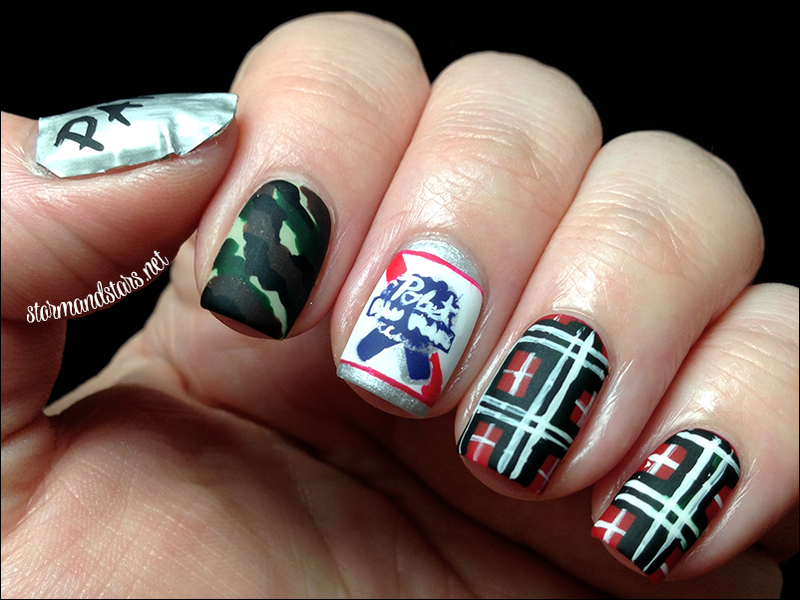 It's Redneck week here at The Nail Art Guild and I have a super fun mani for you that I really enjoyed doing. Usually I do my Guild manis the day of cause I'm so busy, but I got a chance to do them yesterday and I am so happy with how they turned out. When I saw the prompt for the week I knew I wanted to do beer cans right off the bat, but trying to do 5 different ones was a bit daunting, so I settled on a mixture of redneck type things. 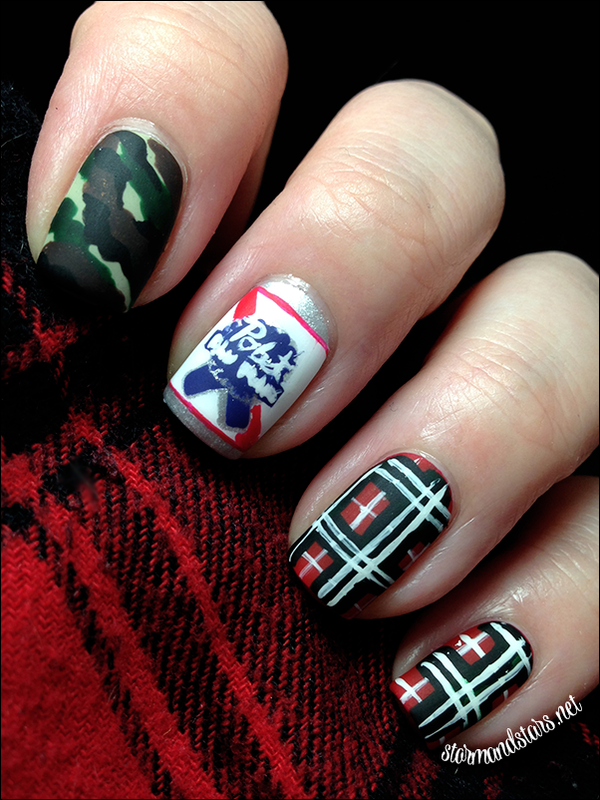 My lines aren't perfect on the plaid, but I suppose plaid isn't usually perfect anyway, and the words on the beer can should say Pabst Blue Ribbon, but well... even I can't paint that tiny. But I think it is recognizable at least right? 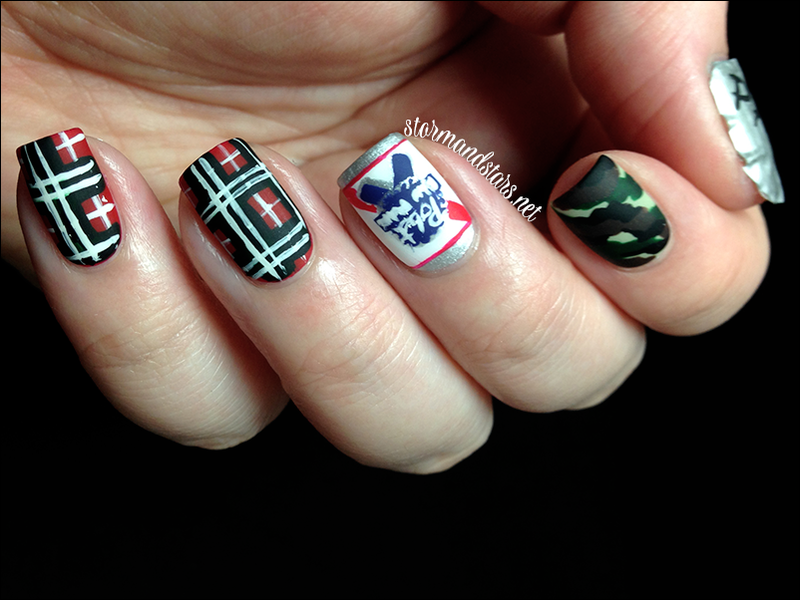 I'm crazy happy with the camo nail though and now I want to do a full set of those! For the plaid nails I started with a red base (Wet n Wild I Red A Good Book), then I went in with Illamasqua Rampage, using just the polish brush and added some thick dark green stripes. I used my white striper to make the white lines and then just went in with my black striper and cleaned up the white a bit in the green areas. 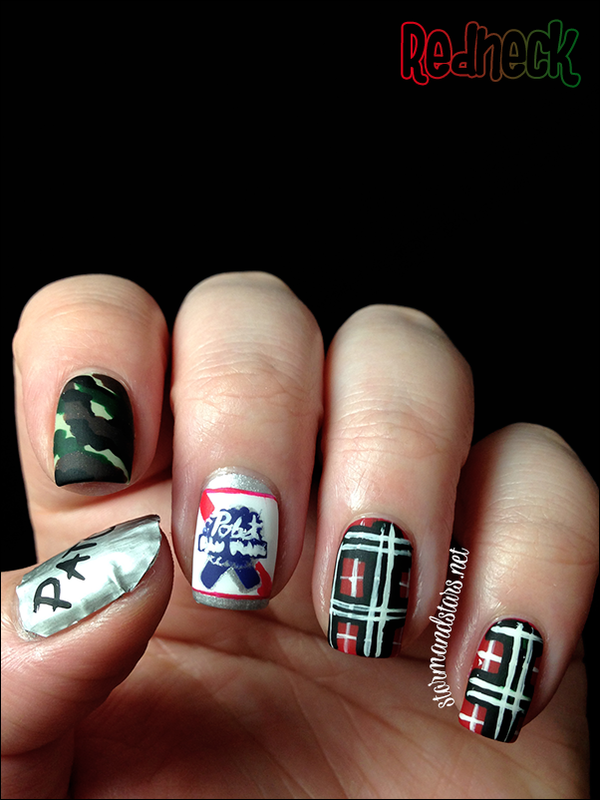 For the PBR can I started with Cult Nails Lethal and then (after it dried with the help of Seche Vite), using my favorite straight Nail Vinyls I taped off the very top and bottom and painted on OPI Alpine Snow. I used a small detail brush and Cult Nails Evil Queen (red), Cult Nails Wack Slacks (blue), Cult Nails Lethal (silver) to do the logo. I added the words with a white striping polish. For my index finger I started with a base of OPI Stranger Tides, which is the perfect green for camo nails. I used one of my thicker detail brushes to add in splotches of color using Illamasqua Rampage (dark green), Cult Nails Swanbourne (dark brown) and Cult Nails Nevermore (black). This was so easy to do and I can't wait to try it again. My thumb was easiest of all. It's also kinda a joke. I broke my thumb nail recently and had a hell of a time trying to patch it before giving up. 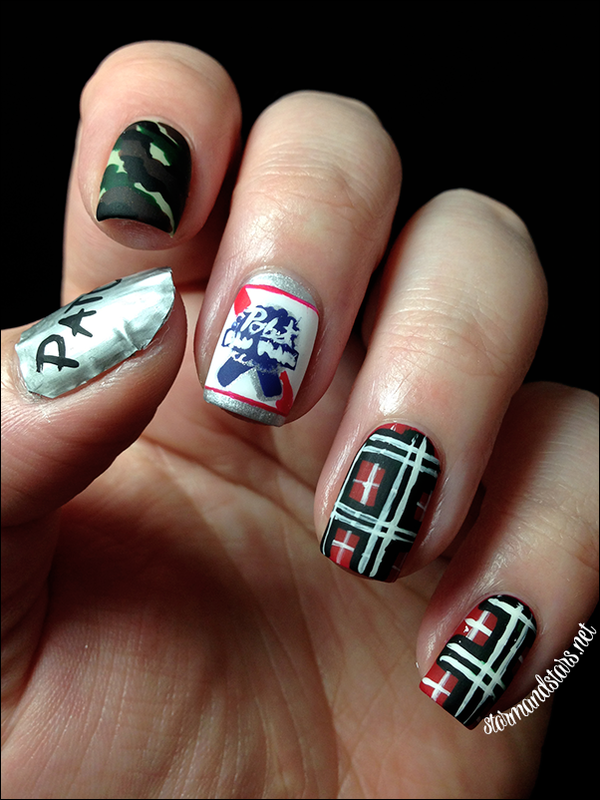 So I thought I would poke a little fun at myself by using duct tape as a patch for this nail art. I just cut out a small piece of tape and placed it on my nail (on top of basecoat so I wouldn't damage the nail) and then I trimmed it to fit. I added the word "PATCH" in a black acrylic paint to top it off. After everything was done I used Seche Vite to seal it all in and then my favorite matte topcoat, Essie Matte About You to give it a completely flat matte finish. In the end, I am so happy with this manicure. I wasn't planning on wearing this out, but I like it so much that I wore it to work today. Hey, its dress down Friday right? I ended up taking off the duct tape and repainting my thumb using the same camo print as my index finger so everything matches nicely. Don't forget to head over to @thenailartguild on Instagram to check out all the other member's manicures today! I can't wait to see what everyone has in store for us today! Born Pretty Store | Cats In Spaaaaaace!